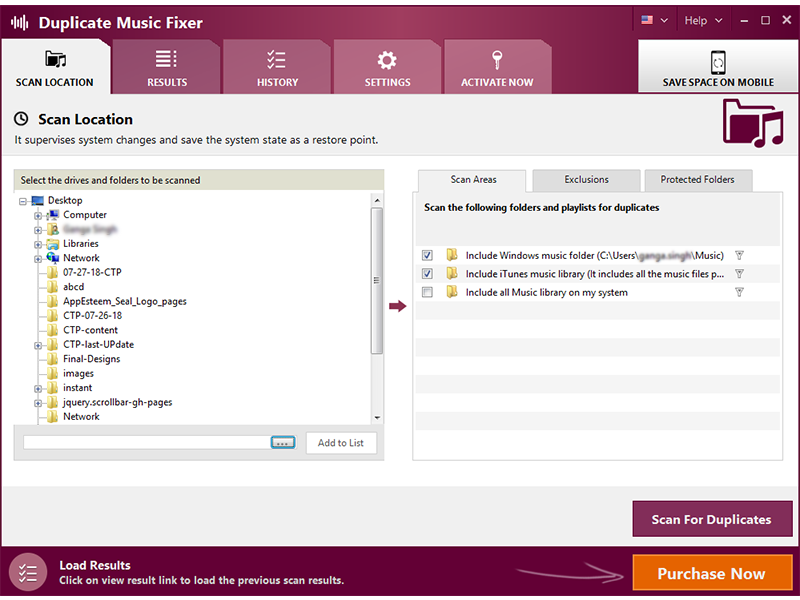 Duplicate Music Fixer scans and removes duplicate audio files to free system from music clutter. The app keeps highest quality audio files automatically from the group and delete others. It scans complete system for duplicate audio files and shows a list that can be filtered by bit rate, preferred folder option, file format, and size. Not only this the app creates playlist automatically and its Auto Mark feature helps to filter out the best file out of duplicates automatically without any manual intervention. Duplicate Music Fixer arranges music better by removing duplicate music files, managing storage space and organizing music collection. Simply add folder(s) and click on Search Duplicates to let the app scan for duplicates music files stored on your system. Once scanning is finished the program will identify original and all duplicates for each song in the folder. Use selection assistant to auto mark duplicates and save valuable disk space. The app works in intuitive and user-friendly manner, it helps to organize music library, recover disk space, improve music streaming on system.